Who Will Adopt That Stripy Little Cat? Mrs. Cosy is trying to find someone to adopt that stripy little cat left at the animal shelter. But nobody wants the little troublemaker. Mrs. Cosy enjoys her job at the Hummingbird Animal Shelter, where she finds homes for stray animals. Alas, nobody but Mrs. Cosy seems to enjoy their latest newcomer, a stripy little cat that looks like trouble. When the little cat refuses to come out from under the couch, she is called Cantankerous; when she runs up and down the drapes or hangs from the screen door, she is called Persnickity. And even though Mrs. Cosy is amused by the cat's antics, nobody wants to adopt a no-good stripy cat that is too wild, too lazy, and too loud. But all is not lost. The stripy little cat has made up his own mind who should adopt him. He has decided to cling to Mrs. Cosy's socks and will not let go. And when she takes him home, Mrs. Cosy discovers that the little cat shadows her every move. But what name will Mrs. Cosy choose? Plucky? Trusty? As hard to shake as gluey paper? Constant as the sea? A comfort sure and true? In the end, there's only one name that fits that stripy cat. Velcro. And it's a name that's sure to stick. About Norene Smiley (Author) : Norene Smiley is a published author of children's books. 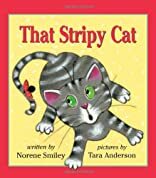 A published credit of Norene Smiley is That Stripy Cat. About Tara Anderson (Illustrator) : Tara Anderson is a published illustrator of children's books. 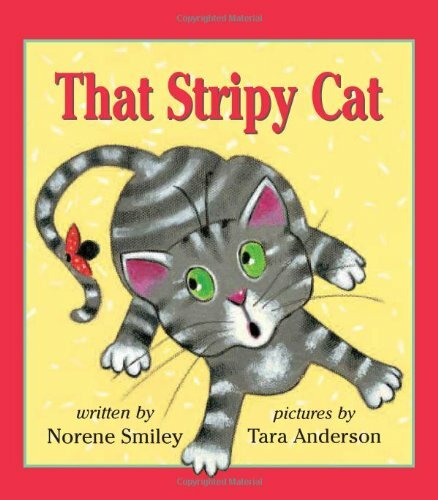 A published credit of Tara Anderson is That Stripy Cat.